1. Emiline Potter b 18 Jan 1888; m. 12 Nov 1905 to Daniel May Vanover. 2. Isaac Potter b 6 April 1889 d 6 Nov 1968; occupation, Coal Miner; m. (1) to Dollie Hall. Isaac Potter m. (2) to Annie Little. Isaac Potter m. Cindy McCray. Isaac Potter m. Maggie Bentley. Isaac Potter m. Matilda Hall. Isaac Potter m. Susie Hall. 3. 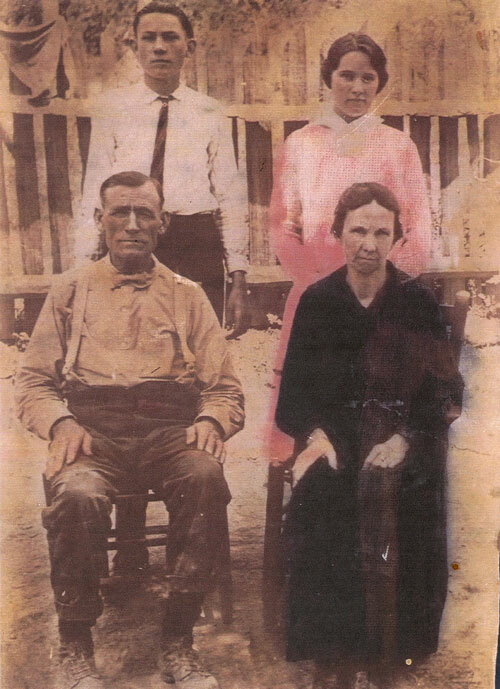 Samuel Potter b Feb 1890 d 19 May 1928; occupation, Coal Miner; m. Mattie Wright; d/o John Phillip Wright and Mary Chaney Reynolds. Mattie Wright m. (2) to Denton Houston. 4. William Sherman Potter b 18 Feb 1895 d 21 Jul 1971; m. Augie Reynolds b Oct 1894 KY d 9 Dec 1967 Jackson Co OH; d/o Joseph Coleman Reynolds and Hortense Lee Friley. 5. John Calvin Potter b 30 Jan 1897 Neon, Letcher Co., KY d 9 Feb 1956 Elizabethton, Carter Co TN; buried Happy Valley Cemetery, Carter Co TN; occupation, Coal Miner and a Farmer; m. 4 Jul 1917 Letcher Co KY to Hattie Rosemond Holcomb b 27 Feb 1903 Letcher Co KY d 24 Mar 1972 Elizabethton, Carter Co TN; buried Happy Valley Cemetery, Carter Co TN; d/o Prince Edward Holcomb and Cora Phynetta Holbrook. 6. James Irvin Potter b 4 Feb 1900 d 29 May 1922. James Irvin never Married. 7. Clabe Potter b 29 Jan 1901 Neon, Letcher Co KY d 4 Aug 1967 Jenkins, Letcher Co KY; m. 1921 (1) to Braskie Hall. Clabe Potter m. (2) to Anna Lee Hall; d/o Joe Hall and Matilda Mullins. Clabe Potter m. (3) to Cynthia Johnson; d/o Dow Johnson and Elizabeth Lizzie Collier. Cynthia Johnson m. (1) to Hayes Little; s/o Stephen Little and Mary Polly Little. 8. Angeline Potter b 9 Feb 1903 Letcher Co KY d 5 Jan 1922; buried Reuben Potter Cemetery, Hemphill, Letcher Co KY.
9. Boonie Potter b 22 Jun 1904 Letcher Co KY d 20 Sep 1960; buried Hall Cem, Dean Letcher Co KY; m. 14 Nov 1925 to Mary Hall b 12 Mar 1904 Dean KY d 14 Jul 1968; buried Hall Cemetery, Dean KY; d/o Lewis Lute Hall and Julia Tolliver. 10. Rhoda Potter b 7 Sept 1907 Jackhorn, Letcher Co KY; m. 31 Dec 1925 to James Madison Johnson b 10 Sept 1889 Ettie, Letcher Co KY d 3 Jun 1957 Fleming, KY; buried Johnson Cemetery, Dean KY; s/o of Solomon Johnson and Mary Ann Meade. 11. Morgan T Potter b 12 Mar 1910 d 19 Jul 1996; buried Ruben Potter Cemetery, Hemphill, Pottertown, KY; occupation, Coal Miner; m. Alpha Craft. Morgan T Potter m. (2) to Virgie Hunter b 27 May 1913 d in childbirth 26 Nov 1954; d/o Minnie Belle Mullins. Morgan T Potter m. (3) to Helen Bentley b 12 Feb 1934 d 23 Feb 1981; d/o Payne Bentley and Frances Stewart. Thanks to Hazel Potter Thompson for all her hard work and long hours spent in research on this family.